The main reason to have an amazing outdoor living area with fabulous patio furniture is to create a space to enjoy the company and conversation of good friends and family. There are patio furniture designs and collections just for the purpose of cozying up with our favorite people and having a good gab. And maybe some S’mores. Or even better, pass around the growler. 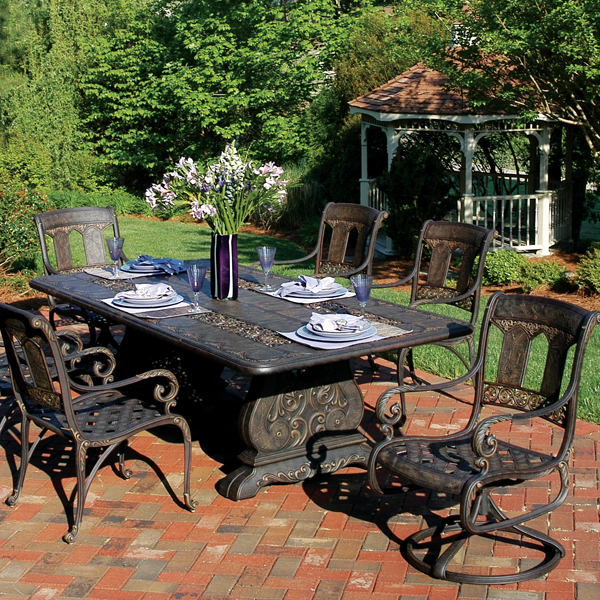 You can class up your conversation sitting in a chat group featuring St. Augustine cast aluminum rockers by Hanamint. There are two options, a regular chat set (view the St. Augustine Chat Set here) and the fire pit set pictured right (view the St. Augustine Fire Pit Set here). Sink into the Sunbrella cushions, lean back and put your feet up or add a fire pit to enjoy on those cool summer evenings! Do you love the concept of a chat set and fire pit but find yourself unsatisfied with the look of the St. Augustine? Another cast aluminum beauty is the Gensun Grand Terrace Fire Pit (view the Grand Terrace Fire Pit Set here). For something on an even grander scale, there is the Corona cast aluminum sectional also by Gensun (view the Corona Deep Seating Collection here). Comfortable and impressive, the Corona comes with custom cushions. If your tastes run to something more modern, Woodard has a beautifully designed wrought iron conversation group, the Jax Collection (view the Jax Collection here). Jax can be ordered in your choice of frame finish, and showcases a modern, transitional style. Another wrought iron option is the Vinings Collection by Meadowcraft (view the Vinings Fire Pit Collection here). Vinings features big, plush rocking chairs that will leave guests in total relaxation. 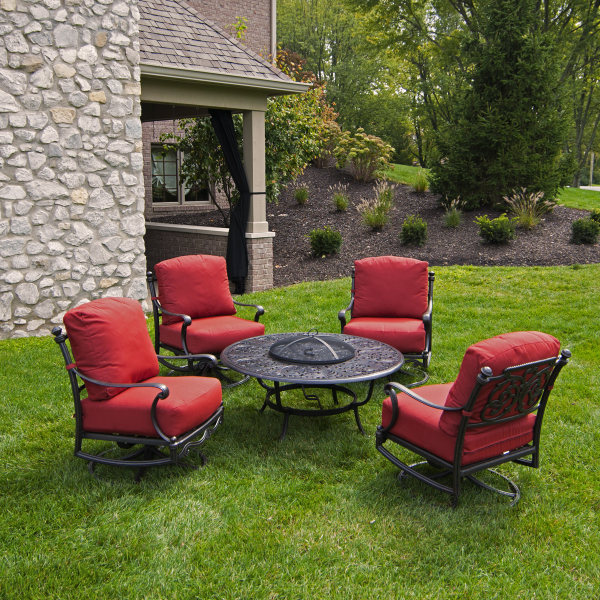 Add the matching gas fire pit for beautiful ambiance and get to gossiping. You haven’t even begun to plumb the depths of Gypsy Sisters! Why do we wait at the neighborhood bistro for those uncomfortable chairs and wobbly tables? Even though they only give us the view of a parking lot and the sweet aroma of car exhaust, there is still something appealing about eating outside. Even cheap plastic dining chairs can’t destroy the romance… much. But who needs the plastic chairs or the inept servers? You can have a better than bistro dining experience every night of the week in your own backyard. With more comfortable furniture and better food… and you don’t have to leave a tip. The outdoor living experience revolves around outdoor dining; why leave it for a few Saturday nights, Grandma’s birthday and the 4th of July? Any evening is a good time to dine alfresco, especially if you have an incredible dining set like the St. Moritz by Hanamint pictured right (view the St. Moritz Dining here).This elegant set with its ornate design and comfy cushion chairs will make even a hot dog look like an epicurean delight. The tables come in large and small styles and there is even a bar table with chairs if you prefer. If you like the look of wrought iron but the St. Moritz is a little too much for you, maybe the Victoria by Alfresco Home is more your style (view the Victoria Collection here). A graceful bit of Italy to bring beauty and functionality to your outdoor space, the Victoria collection features Sunbrella cushions. Of course, the furniture is just part of the experience. Set your table with candles and fresh flowers or a potted plant. Add a tablecloth or placemats. Get out the good dishes once in a while. Keep the menu simple, centered around a fabulous grilled fish or meat dish. (Need a new grill? View All Family Leisure Grills here.) Add some whimsy to your weekday, some delight to your days off, and dine alfresco, at home, tonight! Family Leisure has all kinds of patio furniture and outdoor furniture for sale with free shipping nationwide; view All Family Leisure Patio Furniture here. And Family Leisure has patio accessories to help any person decorate their outdoor room; view All Family Leisure Patio Furniture Patio Accessories here.